This is an obvious but a very necessary step in guttering and drainage. There is nothing more frustrating than buying your pipes, arranging your materials and then looking up and realising that you haven’t got much of an idea about how to install it. Houses and buildings come in all different shapes and sizes and you need someone who knows how to lay pipes and to run them around even the most unorthodox of corners. That is where we come in. At Irving Rain Gutters we have fitted many drainage systems in our time and we are likely to make light work or your house’s system even if it seems like a mammoth task to you! In fact, we enjoy the look on your face when everything is finished, ready to go and in great working order. It makes us feel proud to know that we can take it off your to do list and leave you with far less of a headache for the week. Please read on to know how this works and why it is a good idea to contact the professionals rather than struggles on your own! It’s not a simple as putting in brackets, laying the pipes and joining them. If you want sleek, strong and efficient systems, you need to be minimizing joints, assembling workable seams and to be making sure that the material of your pipe is durable in all weather conditions. The first thing we do is to plan and evaluate the project. We need to inspect the walls and the substrate to make sure that there aren’t any patches of rotten wood and that all the pipes are going to be placed onto secure fitting areas. A measuring tape and a ruler and simple tools but you need the know-how to use them properly. We do a large scale evaluation of the building to make sure there aren’t any surprises on the way round. Many houses have trim boards or small nail holdings just below the roof which needs to be watched out for as well. You’ll ether need to remove this or to add a continuous strip to be placed on the wall where the pipe will go. So, it is not as simple as it seems at first! Definitely better to call the professionals in! Give us a call today so we can walk through our process with you and make sure you understand the way we go about our work. Here is very basic outline - read through the sections of our website or get in contact to understand the process more thoroughly! It might sound complicated to you right now but rest assured that we have done this enough times for it to feel like second nature. 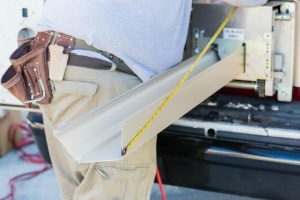 You are in safe hands with Irving Rain Gutters in the area of Irving, Texas.